Black River Falls has halted its pursuit of an indoor e-cigarette ban. The city council last week discussed the proposed ordinance but opted to take no action and drop the issue unless it is raised again in the future. Members of the Jackson County Tavern League appeared back before the council to express the group’s opposition to a ban in private establishments. “I can’t even recall the last time I’ve even had (an e-cigarette) in our business,” said Jerel Gunning, who owns and operates Brockway-based restaurant and bar Re-Pete’s with wife Jen. “There’s enough of government telling us small business people what to do. Alderperson Tony Chojnacki earlier this year raised the idea of adding e-cigarettes to the indoor smoking ban, saying he supported the electronic devices being treated the same as regular tobacco cigarettes in the local ordinance. E-cigarettes, also referred to as vape pens, are battery-powered devices that simulate smoking by vaporizing a liquid solution and emitting aerosol that resembles smoke. Public health officials say the devices contain more than just water vapor and can contain nicotine and other harmful ingredients. Tavern league members previously told the council they had a legal opinion that stated the law doesn’t allow local municipalities to include e-cigarettes in the indoor ban restrictions, which mimic the state law on the issue. 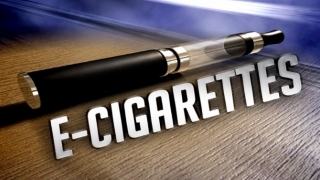 However, the city received a letter in November from the Tobacco Control Legal Consortium that said statutes would allow BRF to restrict e-cigarette use. City Attorney Dan Diehn agreed with the consortium’s opinion. Jen Gunning, like Jerel, told the council last week that the tavern league doesn’t oppose restrictions in city-owned buildings or on city property. She also noted e-cigarettes are legal, while other illegal drug activity in the area should be a higher priority.